Obituary for Gavinna Isabelle MacKenzie | W. J. Dooley Funeral Service Ltd. It is with heavy hearts that we, the family announce the peaceful passing of our Mother, grandmother, great grandmother, sister and friend, Gavinna Isabelle (MacAulay) MacKenzie on Monday, December 3, 2018, at Alderwood Rest Home, Baddeck. Born at Black Rock, Victoria County, on August 26, 1922 to Malcolm J. and Gavinna (Stephenson) MacAulay. While raising seven children, Mom was the central telephone operator for Boularderie prior to the arrival of dial telephones. She worked as a cook in various local restaurants and was well known for her cooking and organizing abilities. Mom was very active in her community, church and local schools. She was a founding member of the Big Bras d’Or Fire Department Ladies Auxillary, Munro Crafters Guild of Boularderie and Arm of Gold Quilters. 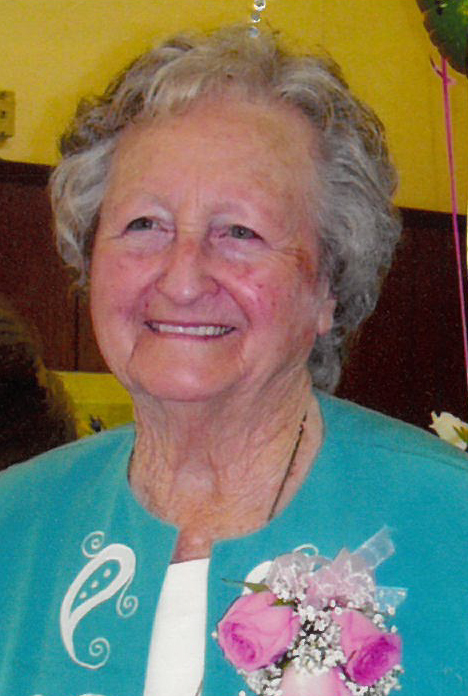 She was a longtime faithful member of St. James Presbyterian Church, Big Bras d’Or, a life member of AMS and St. James Ladies Aid, as well as being a member of Big Bras d’Or Home and School Association and the Alderwood working council. She held various executive positions with numerous organizations and was recognized by several levels of government for her volunteer efforts. She also taught sewing and quilting over the years to many who were eager to learn. Her door was always open for a visit from family and friends and no one left hungry. She would be one of the first to visit an ailing neighbour, or any family with a new baby or needing a helping hand. She was a faithful friend to many. She is survived by five daughters, Eileen (late Joseph) MacDonald, Chelmsford, Mass., Joyce (late Ted) Trenholm, Doreen (Wayne) Jardine, Gwendolyn (Joey) MacLean, all of Boularderie, Leona (Patrick) Penney, Wellington, NS, daughter-in-law, Elma MacKenzie, Boularderie; twelve grandchildren, five step grandchildren, 18 great grandchildren, 8 step great grandchildren, 4 step great great grandchildren; a brother Eldridge (Betty) MacAulay, Groves Point, sister-in-law, Teresa MacAulay, Black Rock, special niece, Linda (John) Collingwood, St. John’s, NL and numerous nieces and nephews. She was predeceased by her husband of 75 years, Rindress, only son Raymond, daughter Deborah Strickland, a sister Josie and brother John Willie (Agnes) MacAulay. The family would like to thank Dr. Peter Poulos for many years as her family physician, Marlene MacIntosh for her excellent care and the VON which allowed mom to stay at home for so long. Thank you to the staff at Alderwood for their care this past year. Visitation will be 2-4 and 7-9 p.m. Wednesday in the W.J. Dooley Funeral Home, 107 Pleasant St., North Sydney. A funeral service will be held 2:00 p.m. Thursday at St. James Presbyterian Church, Big Bras d’Or, with Rev. Peter MacDonald officiating. Reception to follow in the church hall. Burial in Black Rock Cemetery. Memorial donations may be made to St. James Presbyterian Church General Fund, Black Rock Cemetery or a charity of choice.